China - A Chinese government spokesperson claimed that 17 Chinese embassies and consulates in the United States, Canada, India, Britain, France, Germany, Belgium, the Netherlands, Switzerland and Australia have suffered violent attacks since China's military crackdown on Tibetan independence demonstrations. These Chinese military responses may have left as many as a hundred dead and many more injured and imprisoned. 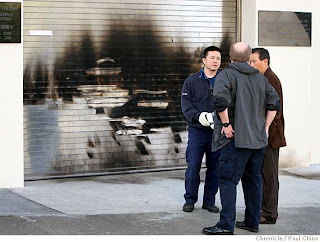 A metal gate protecting the Chinese consulate in San Francisco was damaged after the building was attacked with an incendiary device early this morning. Tibetans in New Delhi stormed the Chinese embassy and clashed with police today. An otherwise peaceful pro-Tibet march in Chicago on Tuesday ended with a broken window at the Chinese consulate.